I lost my princess Emily today. The past few days she hadn't been eating anything, but was drinking tons of water, and piddling on the floor (which is so unlike her). She had a vet appointment yesterday, but the vet called to cancel due to an emergency, so we rescheduled for today at 5:30. Emily's breathing had been quite rapid today, but her eyes followed me everywhere, and seemed alert. I carried her outside to go to the vet, put her down to piddle, and she fell over. I picked her up to put her in the van, and she died in my arms before I got into the garage. Emily was a once in a lifetime dog. She went everywhere with me, hiking, fishing, boating, grocery store, the bank...etc. She was an unusual whippet as no matter where we were, she never needed to be leashed. She was totally trustworthy around home and never strayed off the property. Here is a little story about Emily I wrote when she was voted Whippet Worlds Whippet of the Month in March 2005. Emily was sold as a 9 week old puppy to a lady who had Deerhounds but wanted something smaller to be her perfect pet. All was well, or so I thought, until I got a call from this lady 7 months later. She wanted me to take this horrible dog back, (which my contract explicitly states). I was told she screamed constantly in her crate, pooped and peed in her crate, and when she was put outside in her kennel, she jumped her 6' fence and would disappear for hours on end. The lady was at her wits end, this has been going on for 7 months!!! We agreed to meet and I got Emily back. She was in good condition, well fed, and just lying on this lady's front seat on a blanket like a royal princess. I took Emily home and crated her for the night, and not one peep from her all night. In the morning I awoke to pee and poop all over her crate. Washed all her bedding and we made the crate 1/2 as big (just enough for her to stand up and turn around), crated her the following night, not a peep from her all night, but awoke to the messy crate again. Washed all the bedding again and put it away. We then made the crate just big enough that we could put her in sideways, and all she could do was stand up or lay down (not even curl up, NO blankets either). All this in an attempt to find the crate size that Emily wouldn't want to mess in. After two days of crating like this Emily decided that it was not fun to be crated, so we no longer crated her and had no more 'messy' problems. The next thing to tackle was the kennel fence jumping. I put her in my covered run, and no attempts were made to jump at all. So I put her in the uncovered run, and no attempts were made there either. Next thing was the leash thing, as all my dogs are trustworthy off lead (although not all at once). My hubby decided to take her up to the coal strippings where he likes to hunt, that way there would be no roads (except dirt roads) within about 25 miles. He said Emily NEVER left his side. So I decided to try it here at home (I live in a VERY rural area), and she stayed right here. Emily has been the constant house dog. She is the best dog I ever had, never needs a leash, comes when called, and is just the perfect princess here. She will be 7 years old in April. Emily goes EVERYWHERE with us. To the grocery store, bank, taking Tyler to preschool, fishing, hiking, shooting. She'd rather be with us than with the other dogs. She is such a princess, it's ridiculous. She is a small dog, about 19 inches, and is just the best. She is never crated or leashed, and never kenneled (as a Princess is not to spend time with the common dogs), god forbid she has to step foot inside the kennel (except for mealtimes)...LOL. I love to show my dogs, but although Emily has never seen the inside of the show ring (ewww, other dogs walk there), she will continue to be the Royal Princess here at Eclipse. April has been a very bad month for losing our beloved dogs. Good friends Steve & Gloria called to tell me they lost their precious Bailey (bichon mix), my Zoey's mom Penny passed away last week, and my Vanna's daddy Pungo died this past Monday, and now Emily. I sure hope this is the end of it for a VERY long time. Godspeed to my sweet Princess. I love and miss you and I'll see you soon. 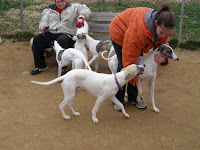 Today Tyler and I went to the dog park with Melissa and Dana and a whole pile of Whippets. Between the 3 of us we had 7, Steeler, Vader and Hank, and puppies Rio, Zachary, Zaria and Tyson. The big boys ran and ran and ran and ran, and Rio only came to see me after about 2-1/2 hours of playing and running around. My dogs have never been to a dog park and I was totally amazed at how good 20-30 dogs can get along in an area while running, barking and play growling with no fights erupting. I give kudos to all the owners of these dogs for their great social skills. I think Tyler had as good a time as the dogs did. 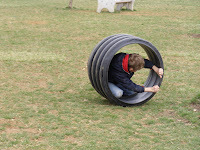 He found one of the big tubes that the dogs are supposed to play in, but being they weren't playing with it, Tyler decided to get in and roll on down the hill. I will definitely visit the dog park again, and hope friends Louise & Shelbi bring out Pebbles, yet another Whippet which I co-own with them, and their two Vizslas. Looking forward to next time.